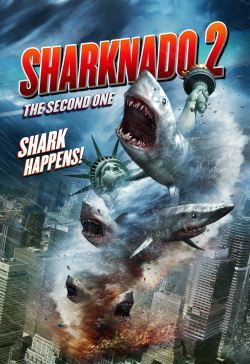 Fin Shepard (Ian Ziering, Sharknado, 90210) and his ex-wife April (Tara Reid, Sharknado, American Pie) are flying to New York City when their plane enters the most unnatural of storms and is battered by airborne sharks. As blood is shed and passengers are maimed in the skies, New York awakens and people spill onto the streets, unaware of the peril descending rapidly towards them. Armed with weapons and explosives, Fin realises he must risk all to save his sister’s family from the greatest of danger as floods and storms crash into the city. From the makers of cult hit Sharknado, comes an adventure sequel full of screams, bloodbaths and bite. The sharks are back.